The Kivo is a child-parent tandem bike with a grown-up sitting behind and a child sitting in front. The child can get a good view of the environment. The rider sitting behind can always keep a good watch on the child. Friends can cycle knowing their companion is not only enjoying the view (instead of looking at their back), but allows discreet supervision from behind. The Kivo has a low step through and therefore, is easier to use. Normally the Kivo has 8 gears and a free wheel switch. You can use the switch-able free wheel to determine whether and how the passenger pedals. The Kivo also has a variant with two wheels behind. 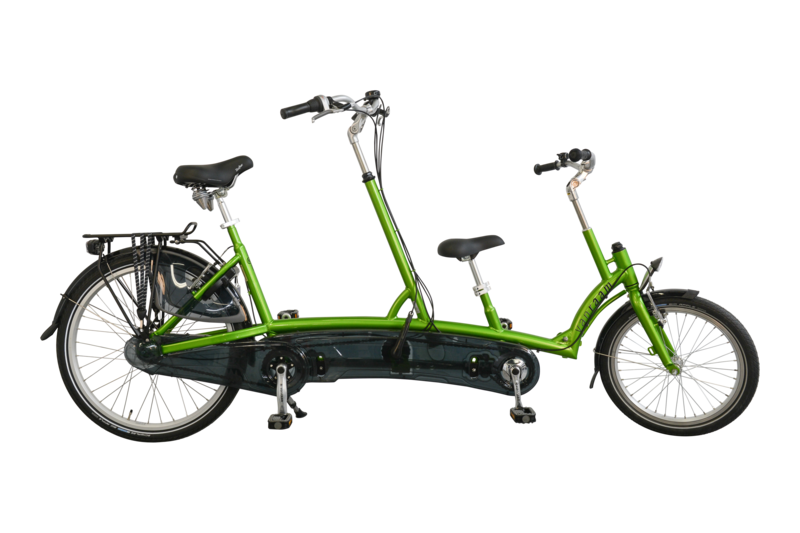 An optional electric engine is possible to install on all the variants, which gives a comfortable pedal support, this makes cycling on this tandem even easier.